TowerPlex coatings are specially designed and formulated to be durable, and long lasting. TowerPlex is a pure 100% acrylic emulsion coating thoroughly tested and formulated for use on galvanized antenna towers or other metal or surfaces. The alkalinity of the vehicle will etch into the zinc unlike ordinary enamels and form a chemical bond. This product dries quickly and has excellent weathering properties. 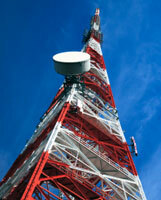 This product is specifically designed for use on galvanized antenna towers. It meets Federal Standard 595 color #12197 Orange. Also complies with national Bureau of Standards report NBS1R75-663 and F.A.A. A/C70/7460-1H. New Galvanize: Must be dry. Clean all oil, grease, or other contaminants in accordance with SSPC-SP1 standards. For maximum performance and when feasible, if spangle is present it is recommended to brush blast to gray galvanize or etch with hydrochloric acid until weathered gray appearance is reached. Follow with clear water rinse until surface is free of blast or etch residue. Note: when blasting or etching use caution to avoid removing excess zinc metal. Existing Towers: Must be dry. Spot prime all rusted areas and remove any contaminants including chalk, dirt, grease, failing paint, etc. Prior to application, prepare substrate in accordance with SSPC-SP1 standards. On unpainted surfaces, clean contaminants such as dirt, white Zinc oxide, etc. and spot prime rusted areas. Existing Towers: Spot prime rust areas with TowerPlex CC2925 Rust Inhibitive Waterborne Primer. New Galvanize: Self-priming, or TowerPlex CC2925 for maximum performance. 592 ft2/gallon at 1 mil dry, assuming no application losses. Coverage will vary depending on color, the surface texture and application technique. Drying time is temperature, humidity, and fi lm thickness dependent. Apply by brush, mitt, roller, or spray. When the temperature is above 90°F make sure that full wet coats are applied, overlapping each pass 50% to avoid dusting. Material can freeze. Avoid applying when overnight freeze or rain is possible. Coverage will vary depending on surface texture, equipment in use, application methods, and experience of the applicator. Proper touch-up is accomplished by applying a thin coat of this product over a well coated surface using the same method of application as used to apply the finish coat, that is, spray over spray, roller over roller. If the finish coat is sprayed, it is also possible to spray a small amount into an empty container, then touching up with a foam brush. Touch up should be done within 5°F of the original temperature.